Cleaning hardwood floors can be tricky. These 7 solutions make it easy to clean any kind of wood floors without harming them. Homeowners across the country are joining the do-it-yourself cleaning products trend, which comes as no surprise to those who have already discovered the ease and efficiency of homemade cleaning solutions. Many common household items clean just as effectively as their commercial counterparts and are usually significantly less expensive to use. Another bonus is that most homemade cleaning alternatives lack the chemicals that are found in many commercial products, which means the natural ingredients are often safer for people as well as the environment. Some households have family members who are allergic to mass produced products, or who may be sensitive to strong scents. Many homeowners like the convenience of reaching for items they already have on hand rather than spending time and money shopping for unnecessary specialty products. There are DIY cleaning products that work on almost every surface and area of the home, including wood floors. If your home has hardwood or laminate flooring, you might want to consider trying some of these homemade wood floor cleaners. But first, know what kind of floor you have and how it’s finished and sealed before selecting a DIY wood floor cleaner to try. Water is usually not recommended for use on waxed floors and should always be used sparingly on all types of wood floors and finishes. Saturating a wood floor or letting water stand can cause damage. 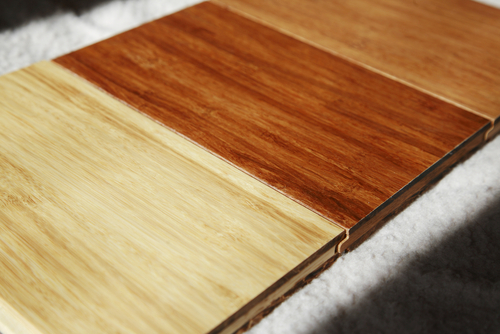 If you have any doubts about how to clean your wood floors, check with your manufacturer to see what they recommend. • You may have already discovered the benefits of using vinegar to clean kitchen counters and bathrooms, but did you know that it can also cut through the grime that builds up on your wood floors? Just two ingredients, warm water and vinegar, give you everything you need to clean and shine your floors. • If you want to add a nice fragrance to your cleaning solution, try this combination of vinegar, water and essential oil when you’re ready to mop. Essential oils come in a variety of fragrances, so choose a few drops of your favorite one to add to your solution for an added sense of clean. • If you’re concerned about using water on your wood floors, or if water is not recommended for the type of floor finish that you have, you might be interested in this homemade solution that uses only vinegar and vegetable oil. Be sure to invest in a spray bottle for applying the mixture. • This simple but effective cleaner uses plant-based liquid soap, vinegar and water with the option to add essential oils. This might be a good choice if your floor is especially grimy. • Do your floors take one lump or two? That’s right – ordinary tea bags can clean your wood floors while adding shine and luster. The next time you make tea, brew a couple of extra bags for your floor instead of reaching for an expensive commercial floor cleaning product. • It may sound more like a salad dressing than a wood floor cleaner, but this combination of lemon juice, olive oil and hot water promises to clean your floors while leaving a rich sheen behind. • If you have laminate flooring, you might be interested in this DIY cleaning solution that uses water, vinegar and dish detergent along with a microfiber mop or sponge. To keep your hardwood floors looking beautiful longer, sweep or vacuum frequently to pick up particles that can build up over time and scratch the surface. To minimize the need for damp mopping, use a dust mop or a dry microfiber pad for routine floor cleaning. Always clean spills right away, and never allow water or any other liquid to remain on the surface of your wood floor. Keep your pets’ nails trimmed to avoid floor scratching, and position mats at entry ways to make it convenient for people to wipe their feet. Use area rugs for high-traffic sections, and make sure to use furniture pads for heavy pieces that sit directly on wood floors. With a little knowledge and a few common household ingredients, you can keep your wood floors clean and sparkling while saving time and money. So, grab your mop, a spray bottle and a few things from your cabinets, and give those wood floors some TLC.